The workshop will begin at 5:00pm with a very brief overview of Career Materials (industry standard Headshots, Resumes, Reels); Online Presence (websites, talent sites and social media); Audition Materials; and stress free Audition Preparation Tips. The workshop will conclude with a 20-30 minute Q&A session, ending at 7:00pm. Actors who wish to have their performance / audition work critiqued should: Prepare to present a strong, memorized, one to two-minute audition or performance piece for evaluation during the workshop. Choose a classical or contemporary monologue, or excerpts from two or more pieces, from an existing theatrical show (television show or film). No profanity. Nothing sexually explicit. You may also include within your two minutes up to 16 bars of one or two songs. No musical accompaniment will be provided. Pieces MUST be memorized. You must also bring a printed copy of your piece, typed, and double spaced for T'Keyah. Allotted time and number of performers selected will be restricted depending on class size. Workshop size is limited. Register for your place now! 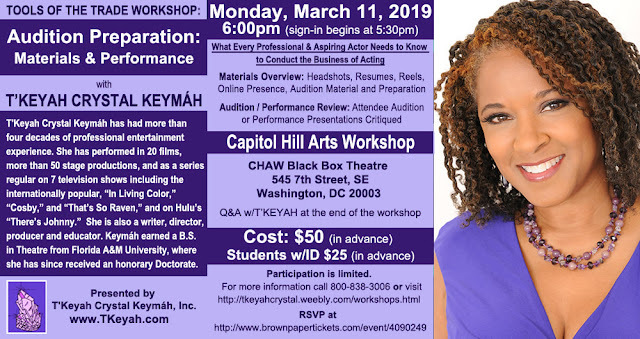 The workshop will begin with a lecture overview of Career Materials(industry standard Headshots, Resumes, Reels);* Online Presence (websites, talent sites and social media); Audition Materials; and stress free Audition Preparation Tips. The workshop will conclude with a 20-30 minute Q&A session. **Actors who wish to have their performance / audition work critiqued should: Prepare to present a strong, memorized, one to two minute audition or performance piece for evaluation during the workshop. Choose a classical or contemporary monologue, or excerpts from two or more pieces, from an existing theatrical show (television show or film). No profanity. Nothing sexually explicit. You may also include within your two minutes up to 16 bars of one or two songs. No musical accompaniment will be provided. Pieces MUST be memorized. 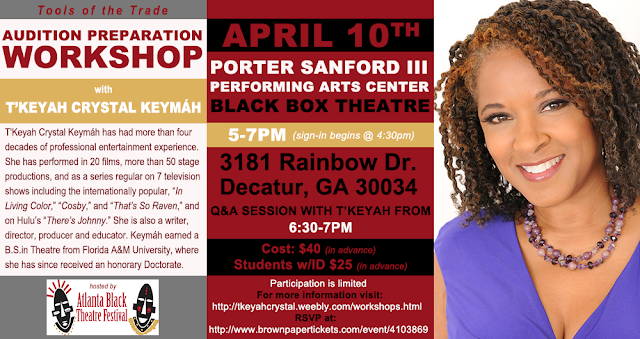 You must also bring a printed copy of your piece, typed, and double spaced for T'Keyah. Allotted time and number of performers selected will be restricted depending on class size. For more information Call ( or visit. T'Keyah Crystal Keymáh has had more than four decades of professional entertainment experience. 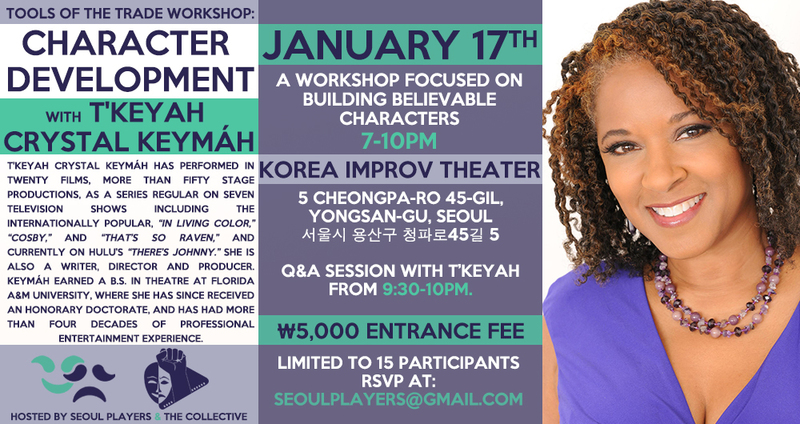 She has performed in 20 films, more than 50 stage productions, and as a series regular on 7 television shows including the internationally popular, In Living Color, Cosby, and That's So Raven, and on Hulu's There's Johnny. She is also a writer, director, producer and educator. Keymáh earned a B.S. in Theatre from Florida A&M University, where she has since received many awards including an honorary Doctorate. 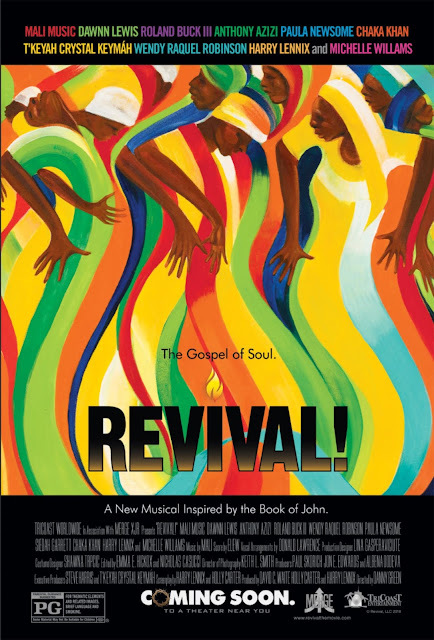 Revival!, an imaginative retelling of the gospel according to John the Apostle featuring original and contemporary gospel music will hold it’s world premier Monday, Dec. 4th at The Museum of The Bible, 400 4th Street SW, Washington, DC. The evening will begin with a VIP cocktail reception and red carpet, followed by performances featuring the film’s stars in advance of the evening’s 7:30 screening. To view the trailer, please click here. Revival! opens Dec. 7 in theaters in New York, Atlanta, Chicago, Philadelphia, Miami, Houston, Detroit, Dallas and Los Angeles. In January, it will expand to screens in Memphis, Baltimore, New Orleans, Norfolk, St. Louis, San Francisco, Cleveland, Orlando, Boston, Tampa, Indianapolis and Milwaukee. The all-star cast includes 10-time Grammy winner Chaka Khan, Michelle Williams of Destiny’s Child, Siedah Garrett, Mali Music, T’Keyah Crystal Keymah, Dawnn Lewis, Niki J. Crawford, Wendy Raquel Robinson, Paula Newsome, Victoria Tilford, Harry Lennix and Chester Gregory. Lennix, Carter and David C. Waite are producing the film through Merge-XJR: Exponent, Jupiter Film Group and Relevé Entertainment. Steve Harris and T’Keyah Crystal Keymah are executive producers of Revival! The film is distributed by TriCoast Entertainment Worldwide. For more information please visit www.revivalthemovie.com. Tools of the Trade Workshop - Norfolk VA 5/7/18! More than 25 years after bursting onto the television scene in Fox’s Emmy-winning series “In Living Color,” T'Keyah Crystal Keymáh reunites with one of her “In Living Color” co-stars, Tommy Davidson on screen in Anthony C. Ferrante’s SHARKNADO 4: THE 4TH AWAKENS. Playing the sharp and tech savvy Tech Terry, Keymah will be making a celebrity cameo appearance alongside Davidson and Donna Mills (Knots Landing). "It was great working with my buddy Tommy again, it was as if no time had passed since we were on the KTLA lot 20 years ago,” said Keymáh. Sharknado 4 marks the return of T'Keyah Crystal Keymáh to television since her last guest starring role on BET's “Let's Stay Together” in 2013. She will be appearing next in the quirky college comedy feature film “What Happened Last Night,” directed and produced by Candice T. Cain. She’s currently in post-production for the musical feature “Revival!” in which she performs and is producing. Her newest solo stage show “Don’t Get Me Started,” the follow up to her award winning “Some of My Best Friends,” will debut in Chicago this fall. SHARKNADO 4: THE 4TH AWAKENS premieres on the Syfy channel, July 31st at 8 PM ET.